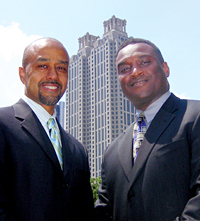 When James Pitts '95 and William Lampley '94 started Kellogg Partners, their new commercial real estate firm in Atlanta, they wanted a name that represented their core business values and the genesis of their relationship. Their alma mater fit both criteria. "Kellogg represents the reason we [came to Evanston] - the quality and level of excellence and teamwork," says Pitts. The two have been close friends since Pitts arrived on campus in 1993 and hit it off immediately with Lampley, who was then in his first year. Boldness and innovation are apt descriptions of Kellogg Partners, which with its founding in April became one of the few commercial real estate firms in the country owned by African-Americans. Though the company is a demographic rarity, it was a relatively common set of mid-life reflections that led Pitts and Lampley to consider starting their own business. After working together at Jones Lang LaSalle in Atlanta since 2001, Lampley notes that the two men "hit a [birthday] milestone at the big four-oh" earlier this year. They also had on obvious passion for real estate which led Pitts to ask, "What if we did this for ourselves?" Pursuing their venture has inadvertently resulted in Kellogg Partners serving as a "clearinghouse," says Pitts, for minorities and women who have always been interested in real estate but found it difficult to develop the necessary relationships to enter the field. The two Kellogg grads receive weekly inquiries from people who are fascinated by the business but who don't know how to break into the clubby atmosphere, so Lampley and Pitts often help by using their contacts to get such individuals in the door at major firms. "We are truly committed to women and other minorities seeing what this industry is all about," says Lampley. "These are individuals who have the mental acuity to navigate commercial real estate." Now these fellow travelers have trailblazers to lead the way.